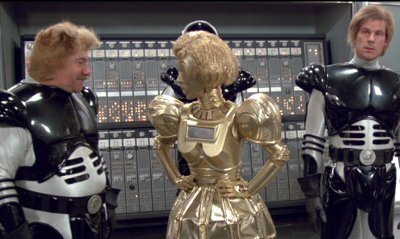 Planet Spaceballs is running out of air so Lord Dark Helmet is dispatched to kidnap planet Duidia's Princess Vespa to exchange for their bountiful atmosphere. Only Lone Starr and his faithful sidekick Barf can save the day! The prison on planet Spaceballs in inexplicably equipped with an AN/FSQ-7.